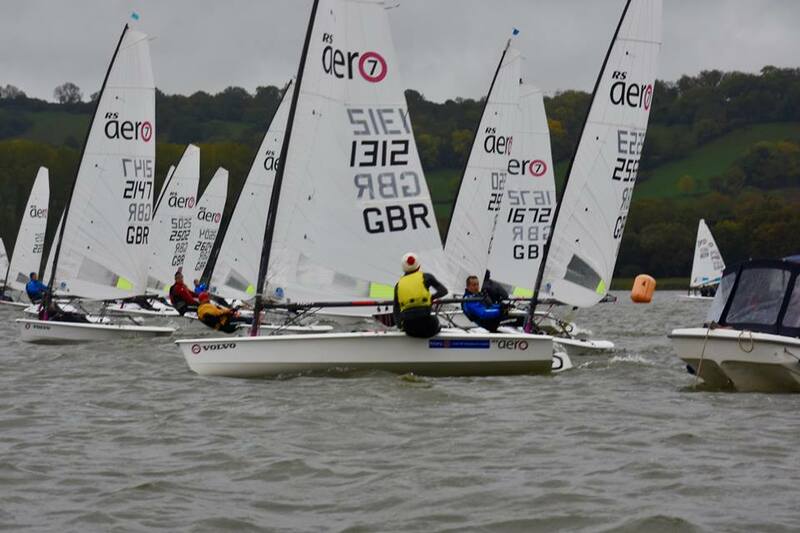 Chew Valley Lake Sailing Club played host to the RS Aero UK Inland, Ladies, and Masters Championship on the 13/14 October which was also the 5th round of the RS Aero UK Southern Circuit series. It looked like it was going to be a fresh Saturday thanks to Storm Callum. 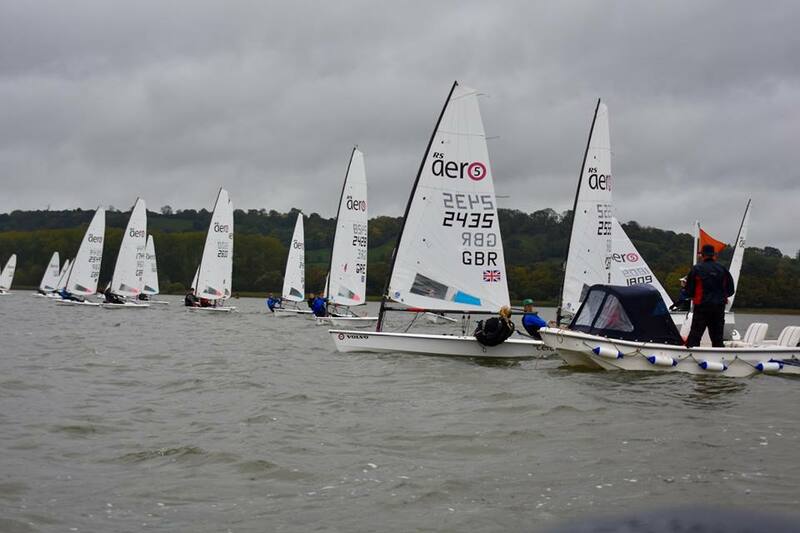 53 Aero sailors arrived to patchy blue skies but a hefty breeze averaging above 30 knots. This was a great turnout considering the forecast, even after a further 9 pre-entered sailors had stayed home with the storm warning. A postponement was made before the proposed 12pm start. Unfortunately, the wind didn’t moderate enough by the 2pm review and racing was cancelled for the day. Thankfully, social secretary extraordinaire, Greg Bartlett, had organised dinner for 40 at the Bear and Swan, 5 minutes from the club, where the majority of the sailors went to fuel up for the next day. The wind had now eased, and a nice 12 knot breeze greeted the sailors, but instead of bright blue skies, the rain fell. This didn’t stop any sailor’s enthusiasm to go out though. A triangle-sausage course was set, with 2 windward marks, the shorter one being used for the RS Aero 5 fleet. The 31 strong ‘7’ fleet started first, and the ‘5’ and ‘9’ fleets followed together, 5 minutes later. The first race saw a hugely impressive start by Lynn Billows of RS Sailing in her first RS Aero event by port tacking the entire RS Aero 5 and 9 fleets to slingshot herself into a good lead! Sammy Isaacs-Johnson decided that being first to the 5’s windward mark wasn’t enough for him, so he decided to sail further to the 7 and 9’s mark and give the rest of the fleet a head start. Sammy recovered to win (I don’t know how!) with local Chew sailor Derian Scott and James Dowrick from Pothpean SC 2nd and 3rd. Sammy continued his fine form to win the other 3 races, and take the Inland crown with one race to spare. Following Sammy in the 2nd race was Lynn in 2nd and Derian in 3rd. 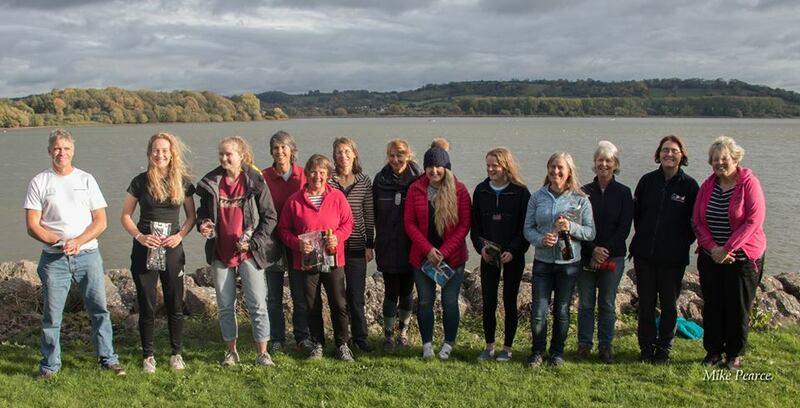 James came back in races 3 and 4 where the wind increased to 18knots, finishing 2nd in both, to finish 2nd overall, one point in front of Derian, who finished 3rd and 5th in the last two races to also take the first Lady prize. First Youth in the 5’s went to Iona Willows from Dorchester SC. First Master was Julie Willis from Lymington Town and first Grand Master Maggie Dunn of Lyme Regis. Sammy’s top tip of the day was; ‘It always helps to remember to read the course before starting’. In race 1, Andrew Frost nailed a port tack flyer (if I say so myself) but was pegged back very quickly by race winner Noah Rees, who managed the wind shifts brilliantly up the beats, and right at the death by Tim Hire, who managed to round the final mark just in front of Frost. The 2nd race finished the same, with the front 3 eking out a good distance in front of the rest of the fleet. As mentioned, race 3 brought a large increase in wind, which added a now very fast couple of reaches which brought large smiles to the sailors. Noah continued to dominate the fleet, holding off Mark Riddington from Emsworth Slipper and Chris Jenkins from Bowmoor to win, just like Sammy, the Inland Championships with a race to spare, plus the accolade of top Youth.. The final race was key to deciding the remaining podium spots, with Andrew and Tim holding 2nd and 3rd before the final race. However, it was Chris Jenkins who won race 4 to jump him up to 2nd overall, with Noah second in the race and local Chew sailor, Nick Martindale in 3rd. These results meant Tim held on to 3rd overall, with Andrew slipping to 4th. First Lady was Caitie Atkin, who revelled the windier conditions. First Master was Peter Chaplin from Burghfield and first Grand Master was John McKeown of Lancing. Noah’s tip was; ‘Make sure you really make use of the downhaul, as it was key to his success as a lightweight in the windier weather’. 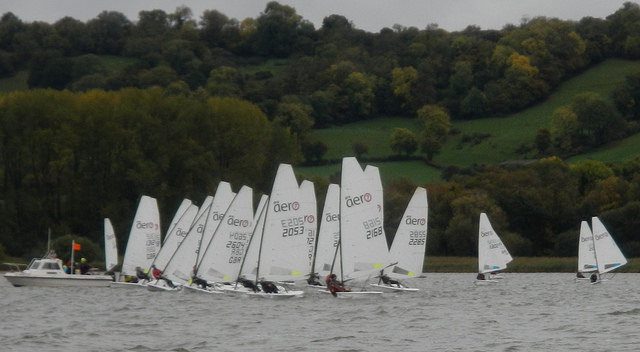 Peter Barton and Ben Rolfe battled out the first race, with some swapping around the course in the gusts and shifts. Greg Bartlett came through to take 3rd. Peter continued his winning ways in Race 2, with Ben recovering to 2nd thriough the fleet to finish 2nd with Matt Thursfield 3rd. Just like the 5’s and 7’s, Peter won the event with one race to spare, winning the third race ahead of Ben again, with Greg 3rd. 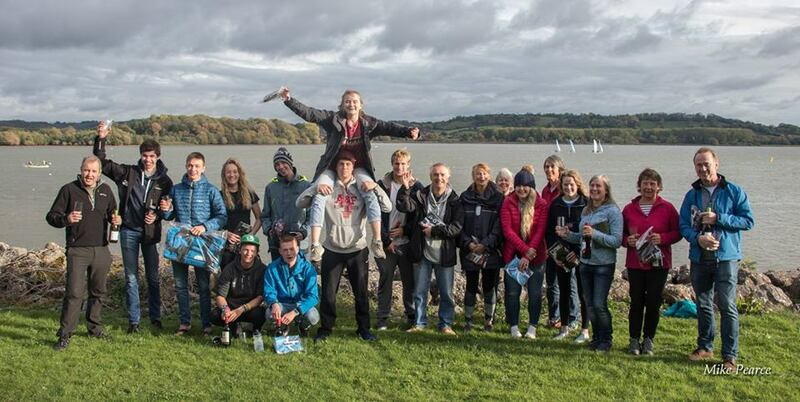 Ben took Race 4, cementing his overall position of 2nd, with Greg 2nd and Matt 3rd, meaning Greg finished 3rd overall. First Master went to Andy Warren from Avon SC. Peter’s top tip is; ‘Remember to let the downhaul and kicker off again in the lulls to re-gain power’. In the strong gusts several sailors wiped out and righting their boats would often find a great lump of weed hanging from the mast top! You had to see it to believe it, definitely a ‘badge of bravery’ rather than a ‘stain of shame’! A massive thank you to all of the volunteers from Chew who helped at the event. Without their dedication, the event wouldn’t have been such a success with the weather we had. A huge thank you to Rooster and Noble Marine for supporting a great prize haul, allowing all the categories to be awarded. Next up is the Chelmarsh RS Aero Open this Saturday 20th followed by the big all RS Classes 'End of Seasons' at Rutland on 3/4th November to close the season, the final event of both the RS Aero UK Northern and Southern Circuits!